Download "Park & Ride. 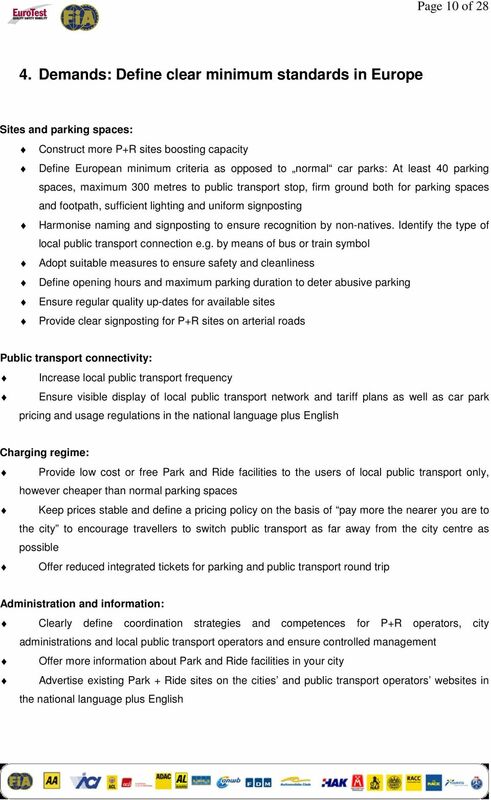 State of the Art in Europe"
4 Page 3 of 28 who normally use only public transport might be incentivised to use parking facilities available in proximity to the city. The result would be higher traffic volumes and declining use of public transport especially in the greater area of a city. The above shows that new P+R sites should be part of the transport concepts for a city and its environs. 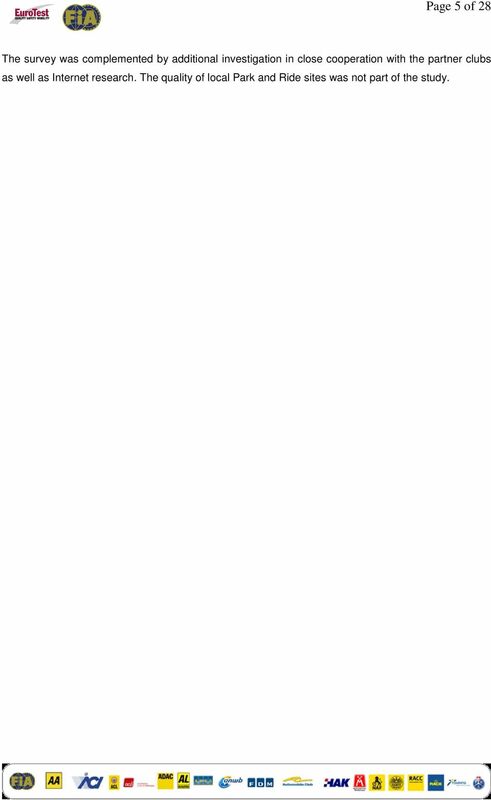 Generally, planners should analyse the target user group of a P+R site. In conurbations, people who commute into the city every day to work are the key target group. Examples in Germany show that commuters account for about 80 percent of the users. In addition, the sites should also appeal to tourists and shoppers or event-goers in order to optimise usage outside office hours. Development and maintenance are expensive and should be cost-effective Planners identify the required number of P+R parking spaces for a city by means of a so-called global prognosis. This involves identifying the number of people who commute into a city and its environs for work and who may perceive P+R as an alternative to the car. The result is increased by about ten percent to include other commuters as for instance shoppers. To be able to accurately assess the demand and derive the required parking space capacity, travel distances are investigated by questioning commuters and counting the users of public transport as well as recording the licence plates of the parked cars. Developing and maintaining P+R sites is no cheap affair. Constructing one parking space in Germany costs about Euros, and twice as much if it is a parking deck, not counting purchase of the property. P+R sites featuring more than parking spaces involve considerable expenses with construction costs totalling no less than Euros per parking space. Not forgetting operating costs which amount to 300 Euros per parking space and year, as computed by Munich-based Park & Ride GmbH. The Region Île-de-France transport network in France calculates 30 to 60 Euros per year for an open-air parking space, and ten times as much for a multi-storey car park or underground parking i.e. 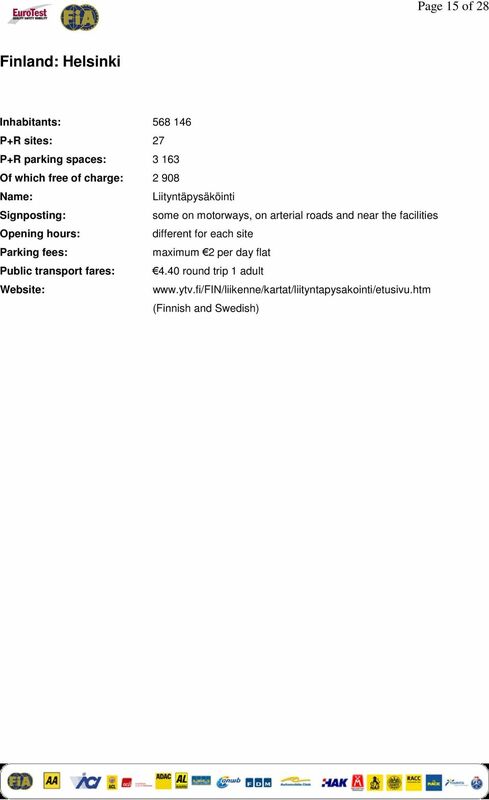 annually between 450 and 760 Euros per parking space. 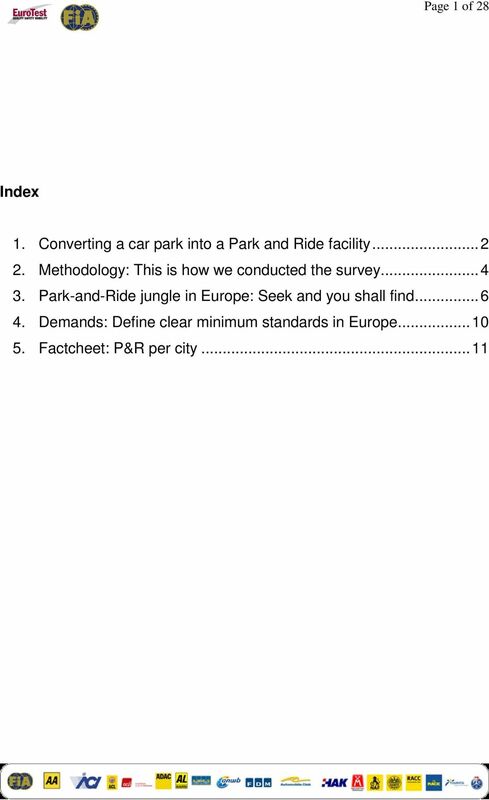 5 Page 4 of Methodology: This is how we conducted the survey Drive to the outskirts of a city, leave your car in a car park and transfer to underground or suburban trains to ride into the city centre. This is how Park and Ride works a practical option for car drivers. Park and Ride schemes are designed to prevent congestion in the city centres and come with the added benefit of saving costs and time for motorists. But like everything else in Europe, the schemes vary considerably in the different countries as regards their name, signposting and pricing. 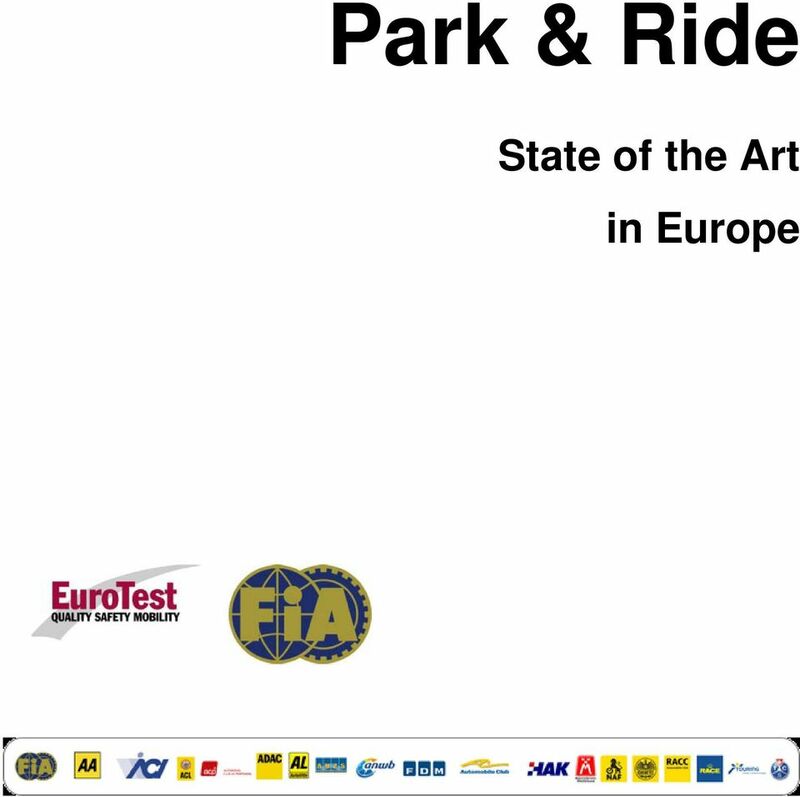 Together with its 17 European partner clubs plus the clubs in Hungary and the Czech Republic, ADAC had a closer look at Park and Ride facilities in the framework of the EuroTest programme. At first, only the capital cities of the partner clubs countries were selected for the survey to the exception of the UK and Switzerland. In these two countries, Sheffield and Geneva were the cities of choice. The city of London did not feature in the survey, since P+R schemes exist in the Greater London area only and not close to the London city centre. In Switzerland, Geneva was selected instead of Bern because it is the location of international organisations and destination of many commuters from France. In Germany, three cities were included in the survey in addition to the capital Berlin. All in all, the survey reflects the situation in the following cities: Amsterdam/ Netherlands, Berlin, Hamburg, Cologne and Munich/ Germany, Brussels/ Belgium, Budapest/ Hungary, Geneva/ Switzerland, Helsinki/ Finland, Copenhagen/ Denmark, Lisbon/ Portugal, Ljubljana/ Slovenia, Luxembourg/ Luxembourg, Madrid/ Spain, Oslo/ Norway, Paris/ France, Prague/ Czech Republic, Rome/ Italy, Sheffield/ Great Britain, Stockholm/ Sweden, Vienna/ Austria and Zagreb/ Croatia. The majority of those cities offer a total of about Park and Ride parking spaces near the city centres at transit points to ride downtown. The survey covered two areas: availability, size and characteristics of P+R systems and local transport connectivity. The focus was placed on the capacities of Ride facilities, the nation-wide designation, signposting and pricing for integrated public transport. Also, P+R extension plans and facility requirements played a role as well. ADAC commissioned the IMK Institute for Applied Marketing and Communication Research with conducting and evaluating the survey. Data was collected in writing from the relevant city officials and representatives of local public transport. A database was generated containing all details from the questionnaires. The data set was subsequently adjusted for the cities where the respondents stated that no P+R system was available or gave conflicting information. This was the case for Brussels, Copenhagen, Lisbon, Madrid and Zagreb. 6 Page 5 of 28 The survey was complemented by additional investigation in close cooperation with the partner clubs as well as Internet research. The quality of local Park and Ride sites was not part of the study. 7 Page 6 of Park-and-Ride jungle in Europe: Seek and you shall find Different signs, different designs, some free, some cheap, some expensive this is Park and Ride in Europe. 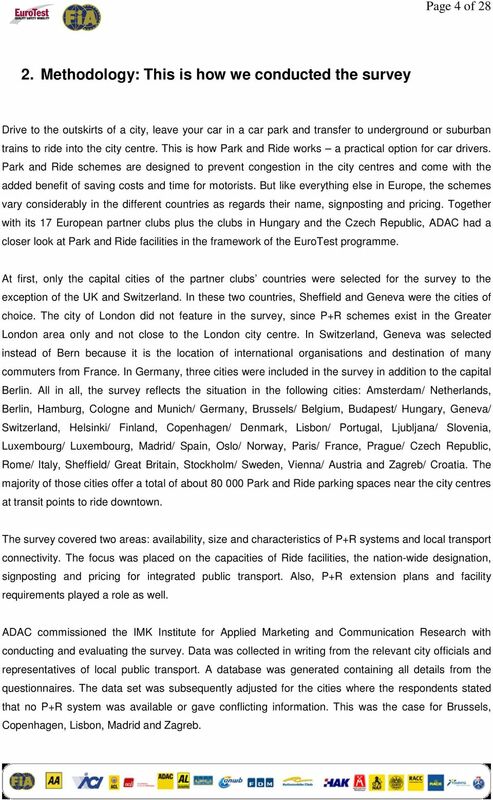 As multi-coloured as life in the individual countries is the array of Park and Ride sites in European cities. 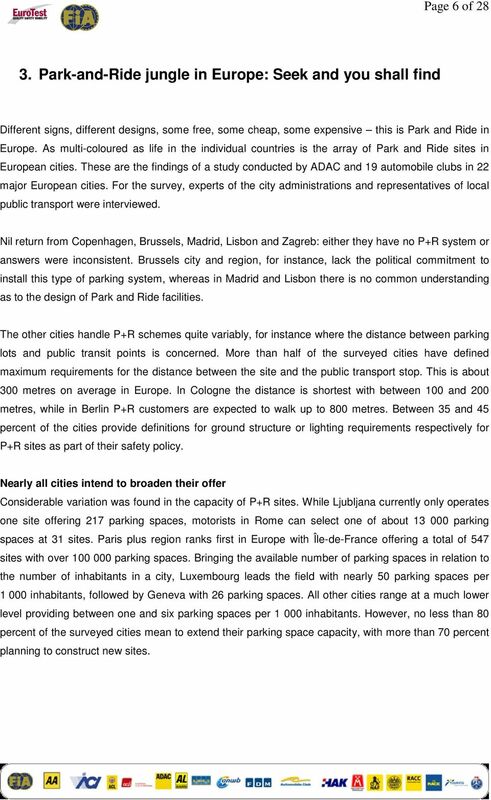 These are the findings of a study conducted by ADAC and 19 automobile clubs in 22 major European cities. For the survey, experts of the city administrations and representatives of local public transport were interviewed. Nil return from Copenhagen, Brussels, Madrid, Lisbon and Zagreb: either they have no P+R system or answers were inconsistent. Brussels city and region, for instance, lack the political commitment to install this type of parking system, whereas in Madrid and Lisbon there is no common understanding as to the design of Park and Ride facilities. The other cities handle P+R schemes quite variably, for instance where the distance between parking lots and public transit points is concerned. More than half of the surveyed cities have defined maximum requirements for the distance between the site and the public transport stop. This is about 300 metres on average in Europe. In Cologne the distance is shortest with between 100 and 200 metres, while in Berlin P+R customers are expected to walk up to 800 metres. Between 35 and 45 percent of the cities provide definitions for ground structure or lighting requirements respectively for P+R sites as part of their safety policy. Nearly all cities intend to broaden their offer Considerable variation was found in the capacity of P+R sites. While Ljubljana currently only operates one site offering 217 parking spaces, motorists in Rome can select one of about parking spaces at 31 sites. Paris plus region ranks first in Europe with Île-de-France offering a total of 547 sites with over parking spaces. 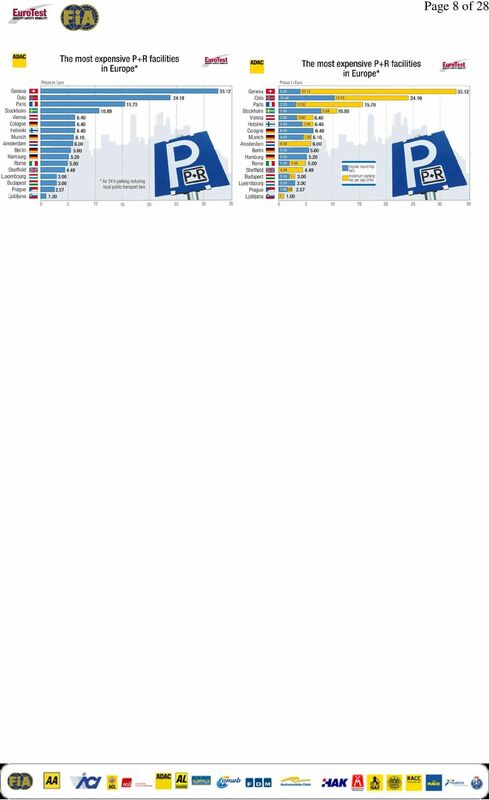 Bringing the available number of parking spaces in relation to the number of inhabitants in a city, Luxembourg leads the field with nearly 50 parking spaces per inhabitants, followed by Geneva with 26 parking spaces. All other cities range at a much lower level providing between one and six parking spaces per inhabitants. However, no less than 80 percent of the surveyed cities mean to extend their parking space capacity, with more than 70 percent planning to construct new sites. 8 Page 7 of 28 Variation does, however, not only affect capacity. There also are striking differences with regard to the pricing policy. 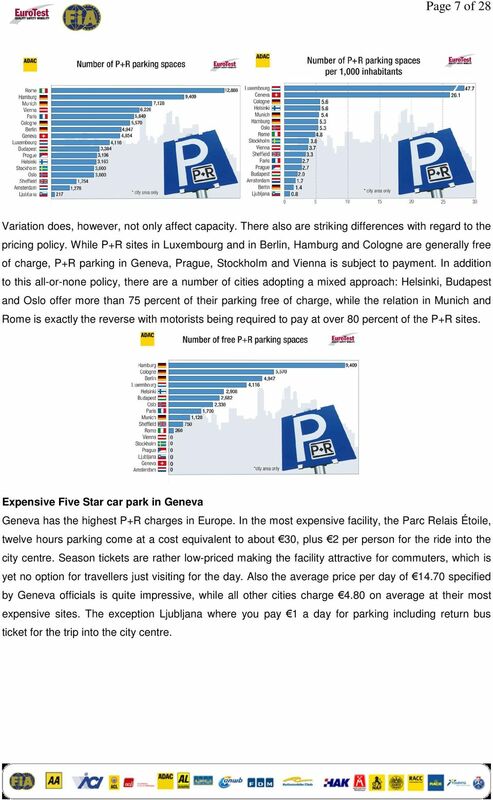 While P+R sites in Luxembourg and in Berlin, Hamburg and Cologne are generally free of charge, P+R parking in Geneva, Prague, Stockholm and Vienna is subject to payment. In addition to this all-or-none policy, there are a number of cities adopting a mixed approach: Helsinki, Budapest and Oslo offer more than 75 percent of their parking free of charge, while the relation in Munich and Rome is exactly the reverse with motorists being required to pay at over 80 percent of the P+R sites. Expensive Five Star car park in Geneva Geneva has the highest P+R charges in Europe. In the most expensive facility, the Parc Relais Étoile, twelve hours parking come at a cost equivalent to about 30, plus 2 per person for the ride into the city centre. Season tickets are rather low-priced making the facility attractive for commuters, which is yet no option for travellers just visiting for the day. Also the average price per day of specified by Geneva officials is quite impressive, while all other cities charge 4.80 on average at their most expensive sites. The exception Ljubljana where you pay 1 a day for parking including return bus ticket for the trip into the city centre. 10 Page 9 of 28 The study revealed a relation between the pricing policy and type of operator. While privately operated sites are generally charged, public facilities provide either free or low-cost parking. Often, though not always, parking gets more expensive the closer the facility is located to the city centre. This is not the case in Prague and Amsterdam where parking fees are identical all over the city. Liityntäpysäköini in Finland is parcheggio di scambio in Italy Signposting policies were found rather inconsistent. 35 percent of the surveyed cities indicate that they install P+R signs on the main arterial roads at best, and 20 percent in the immediate vicinity of a P+R site only. The cities having an obvious aversion to signposting include Rome which is offering the highest number of P+R parking spaces (13 000) in the city area. Looking at the national names for P+R sites in Europe is interesting as well. Just ask for Liityntäpysäköini, if you need directions to the nearest P+R site in Finland. Motorists travelling in Sweden and Norway will face less difficulties since P+R is universally called Infartsparkering or Innfartsparkering. 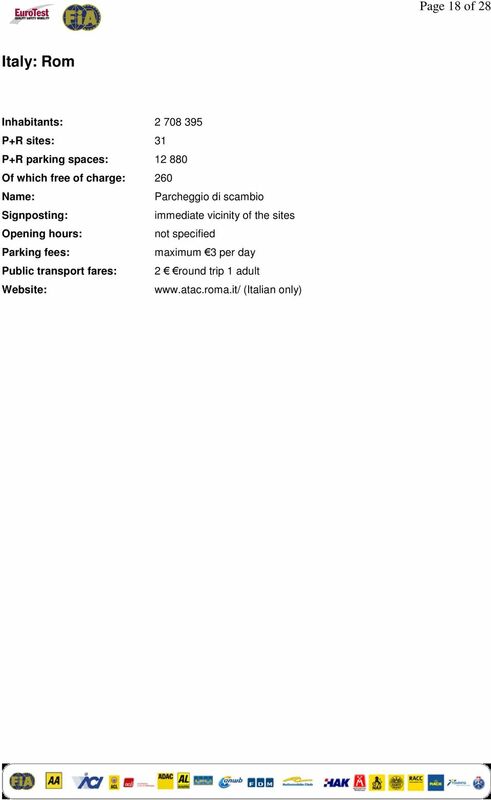 In France and Switzerland, you have to look for Parc Relais, Parking Relais or Parking d échange, while in southern Italy you should watch out for parcheggio di scambio signs. In the Netherlands, the established name for P+R is Transferium. All other survey cities, i.e. more than 50 percent, use Park and Ride or the shorter P+R on most signs. This at least is where European harmonisation is evident. 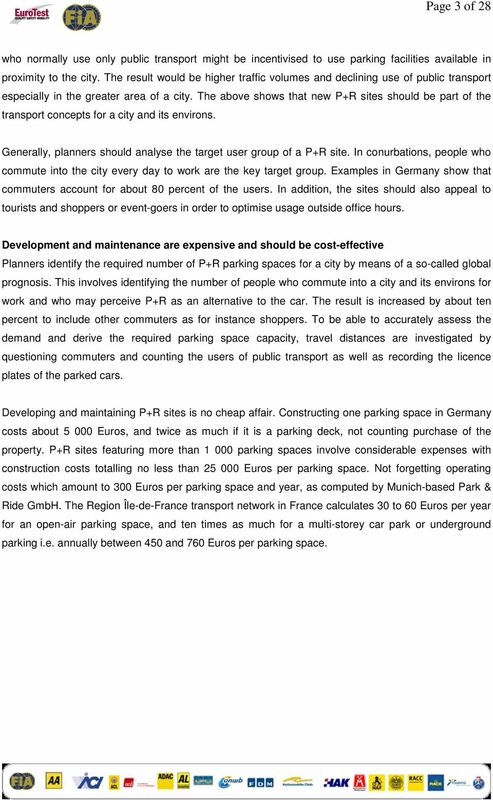 12 Page 11 of Factcheet: P&R per city Germany: Berlin Inhabitants: P+R sites: 44 P+R parking spaces: Of which free of charge: all P+R on arterial roads and near the facilities not specified Parking fees: none Public transport fares: 4.20 to 5.60 round trip 1 adult entwicklung/parken.shtml (German only) Our tip: The above figures relate to the city area. Greater Berlin provides 99 sites with parking spaces free of charge. 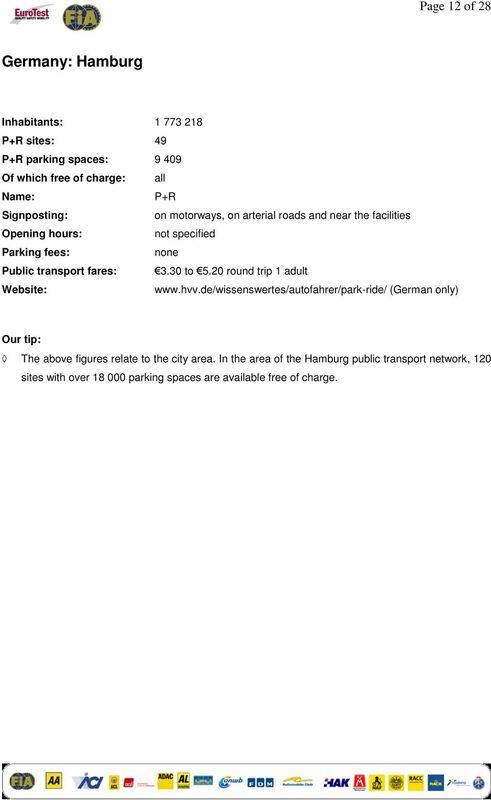 13 Page 12 of 28 Germany: Hamburg Inhabitants: P+R sites: 49 P+R parking spaces: Of which free of charge: all P+R on motorways, on arterial roads and near the facilities not specified Parking fees: none Public transport fares: 3.30 to 5.20 round trip 1 adult (German only) Our tip: The above figures relate to the city area. In the area of the Hamburg public transport network, 120 sites with over parking spaces are available free of charge. 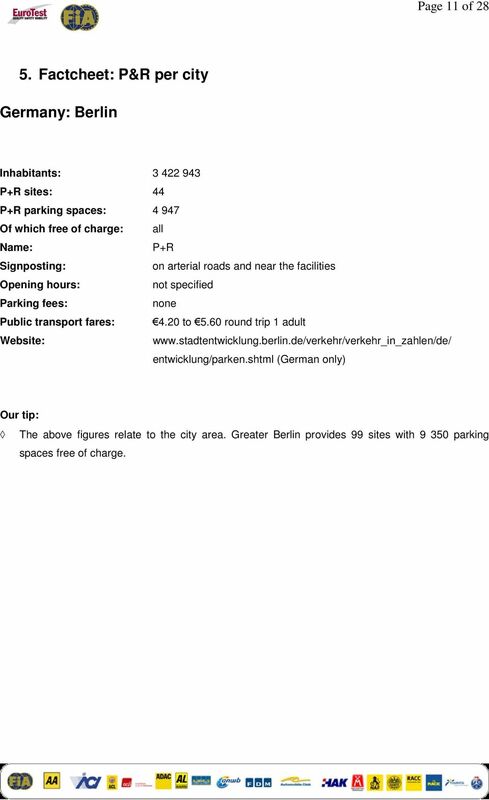 14 Page 13 of 28 Germany: Cologne Inhabitants: P+R sites: 28 P+R parking spaces: Of which free of charge: all P+R on motorways, on arterial roads and near the facilities not specified Parking fees: none Public transport fares: 4.60 to 6.40 round trip 1 adult (German only) Our tip: The above figures relate to the city area. In the area of the Rhein-Sieg public transport network 149 sites with over parking spaces are available. 15 Page 14 of 28 Germany: Munich Inhabitants: P+R sites: 24 P+R parking spaces: Of which free of charge: P+R on motorways, on arterial roads and near the facilities 24h Parking fees: maximum 1.50 per day flat Public transport fares: 4.60 round trip 1 adult (German only) Our tip: The above figures relate to the city area. In the Munich area 100 P+R sites with about parking spaces are available free of charge. 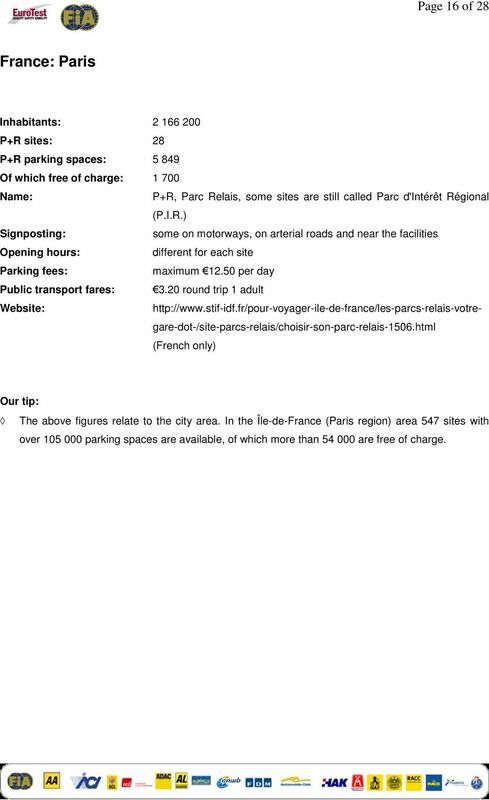 17 Page 16 of 28 France: Paris Inhabitants: P+R sites: 28 P+R parking spaces: Of which free of charge: P+R, Parc Relais, some sites are still called Parc d'intérêt Régional (P.I.R.) some on motorways, on arterial roads and near the facilities different for each site Parking fees: maximum per day Public transport fares: 3.20 round trip 1 adult (French only) Our tip: The above figures relate to the city area. In the Île-de-France (Paris region) area 547 sites with over parking spaces are available, of which more than are free of charge. 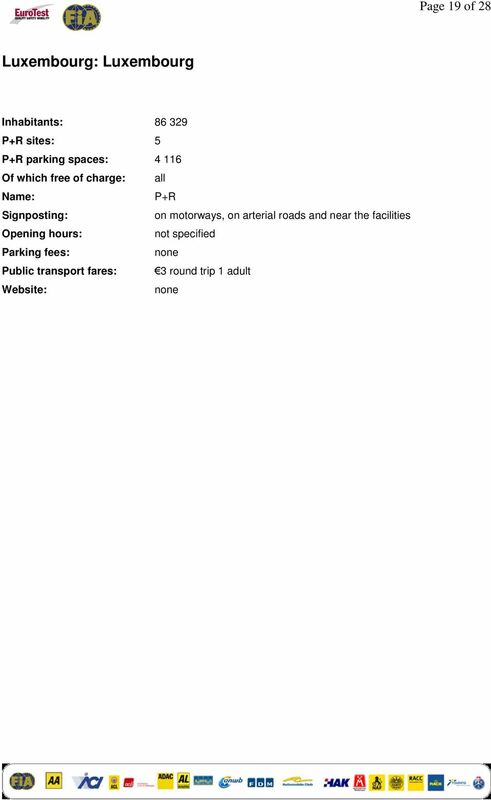 21 Page 20 of 28 Netherlands: Amsterdam Inhabitants: P+R sites: 5 P+R parking spaces: Of which free of charge: none P+R, Transferium on motorway exits of the A 10 motorway between 7.00 and 2200 hours in Bos en Lommer, 24h at the remaining four sites Parking fees: 6 per day flat Public transport fares: round trip for up to 5 persons included in parking fee (Dutch only) Our tip: Upon delivery of the parking coupon, the service staff will supply free public transport tickets. Deliver stamped public transport ticket to service staff and pay reduced parking fee. Please notice: If the public transport ticket is unstamped or was incorrectly stamped, regular parking fees of between 15 and 21 per day will apply. 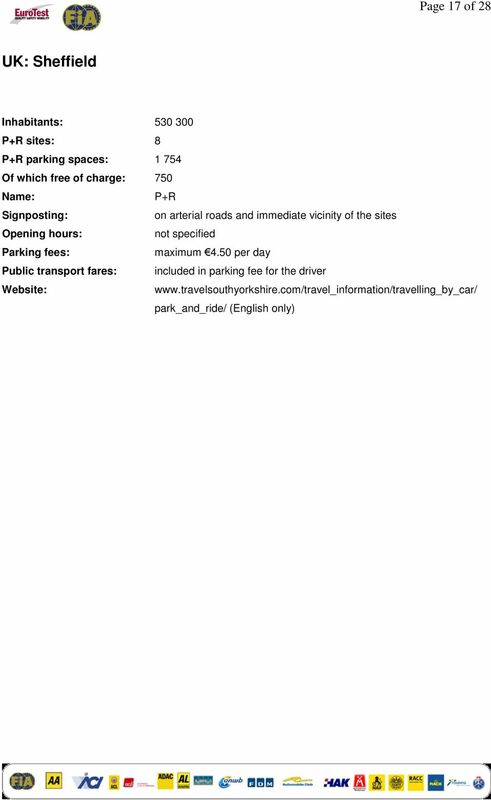 Passenger car parking up to four days maximum at special rate. 22 Page 21 of 28 Norway: Oslo Inhabitants: P+R sites: 5 P+R parking spaces: Of which free of charge: Innfartsparkering some on motorways, on arterial roads and near the facilities, some not signposted not specified Parking fees: maximum 14 per day Public transport fares: 5.20 to round trip 1 adult (Norwegian only) Our tip: Free sites are much closer to the city centre than the sites which are subject to payment. 27 Page 26 of 28 Czech Republic: Prague Inhabitants: P+R sites: 17 P+R parking spaces: Of which free of charge: none P+R some on motorways, on arterial roads and near the facilities between and hours Parking fees: 1 per day flat Public transport fares: 1.50 round trip for the driver (in Czech, German and English) Our tip: Public transport ticket comes reduced for the driver only. All other car passengers are required to purchase a regular ticket. STATISTICS BRIEF LOCAL PUBLIC TRANSPORT IN THE EUROPEAN UNION INTRODUCTION The year 2014 saw the highest number of local public transport journeys in the 28 EU Member States since the turn of the millennium. Holland Image 2012. POSitive and negative Aspects. Top 3 associations with Holland. NBTC Holland Marketing. 1. japan 47% 1. germany 56% 2.
) Match the words from the 1st coloumn to the words in the second.